VOL. I NO. 42 REG NO. L5015 DELHI, THURSDAY JULY 1, 1943. MMMMM, MARJORIE This week's page one morale booster introduces Roundup cheesecake fans to Marjorie Woodworth, who, you'll agree, looks more apropos in her fetching costume than she would in a fur coat. JUNE 24 - B-24's hammered at the Mandalay railroad yard, while mediums pounded railroad sheds at Kanbyu, tracks at Tindeinyan, barracks at Shwelhi and railroad installations at Kinu. JUNE 25 - Heavies bombed and strafed barracks at Thanbyuzaya and struck at radio installations on Diamond Island. B-25's were busy at Monywa and Ywataung. JUNE 26 - Medium bombers slugged railroad installations at Shwebo, smashed two locomotives with 16 bombs, socked a cantonment at Meiktila and attacked Kanbalu and Shwebo. B-24's buried 19 tons of explosives on the railroad construction bas at Thanbyuzayat and destroyed, among other targets, a railroad train with a direct hit; other heavies struck Moulmein and Diamond Island. JUNE 27 - B-25's attacked cotton mills at Myingyan, the railroad reversing station at Sedaw and the railroad station and installations at Monywa. JUNE 28 - Medium bombers were active over Pyinmana and Sagaing. EAST INDIA BOMBER BASE - "Raunchy" is 12 pounds of all-American dog who has spent a third of his 18 months as 10th man on a heavy bomber crew, and who likes nothing better to do between missions than to grab "chair fatigue." His official mission time is considerable: Over 190 hours, 53 of it in combat. And he piled up nobody knows how much additional flying time with a pursuit squadron before transferring to heavy bombers. Calmly cocking his ears to the roar of calibre .50's, Raunchy has ridden out two brushes with Jap 1-45 and Zero interceptors, waiting for the enemy to get within tooth range. Like most heroes, he was non-committal when interviewed. Not so the rest of the bomber crew: Lts. B.V. (Two Cushion) Carr, R.E. Codington, L.N. Levi and N.P. Wagner; T/Sgts. R.A. Washburn and A. Slivensky; and S/Sgts. D.W. Goforth, J. James and D.N. Sabarra. They were more than willing to give out with facts. Raunchy, they said, transferred from pursuit work into heavy bombing at Orlando Air Base, Fla. (Whether "transferred" by day or night is a military secret.) When flying on missions, his favorite post is between the rubber pedals on the pilot's side. He moves out on the flight deck during combat. He has taken 18,000 feet altitude without oxygen - has his own oxygen box for higher altitudes. On missions, Raunchy prefers corn willie. Off duty, he trots about camp at the heels of Goforth, with a ready wag of his tail for everybody. After the war, Raunchy plans to settle down to a quiet family life with a certain charming young lady Spitz, who now awaits the air hero's return at the home of Mrs. Goforth in Little Rock, Ark. WASHINGTON - (WD) - Secretary of War Henry Stimson listed the total American Army casualties since Pearl Harbor at 63,958, of which 7,528 were killed, 17,128 wounded, 22,687 missing and 16,615 were prisoners of war. He added that in all theaters enemy losses were heavier than ours. He described the Philippines campaign as the most expensive, with 31,000 casualties, of whom many are prisoners. He asserted that the diversion of German planes to meet Allied raids on Europe mayt be holding up the expected offensive in Russia. Navy casualties were announced as 7,604 of which 4,732 were wounded, 11,000 missing and 3,556 were prisoners. In World War I the U.S. had 350,300 casualties. CHINA AIR BASE (Delayed) - War communiques stoically, factually relate the successes and defeats of the Army Air Forces. The loss of a 14th Air Force ship in the recent Canton raid, the only U.S. aircraft lost compared to 16 Jap planes destroyed, made only a base line in the communique. But the story of the mission will live long in the memory of the comrades of the missing crew. They live in fame, these members of Gen. Claire L. Chennault's "Sky Dragons." Today, after a few minutes' briefing, these men of the mighty "Dragons" re-adjust their helmets, tighten their belts and move out to their ships in the dispersal area of the field. There isn't much talk. Only a little bantering goes on here and there. We've been over Canton before. There was the time "Stubby" caught four Nip pilots with their dishonorable britches down... all with the small total of 35 rounds. Conservation wasn't on his mind. The lad was just good. 'CLEAR,' COMES THE CALL After running the props, the pilots take places in their cockpits. The engineer stands by with his fire extiguisher. "Clear," comes the call. You hear the energizer working preparatory to meshing the starter. Out roars a chugblug, accompanied by a blast of white smoke and she catches... purring like a kitten, warming up and gradually stepping up to 1,000 RPM's. The other engine goes through the same process and there you have it, a ship, an instrument of destruction, so deadly and yet so harmless in appearance. The crew climbs aboard and there we wait until the "old man" calls the tower and receives takeoff instructions. There is a highball as he pulls out first, taxiing to the designated point, revving his engines and waiting for his flights to jockey into position... and then we're off. The throttles slowly go forward... farther... firewalled, as the co-pilot locks throttles and we pound down the runway at 120 indicated. The nose is tilted and you feel as if you have actually jumped into the air. AND THE FLIGHTS OFF Behind us, the rest of the flights take off. Soon we are in formation... all hands and eyes... Gunners, bombardier, pilot, navigator, co-pilot, all eyes and damned little conversation over the interphone. Below us, the rice paddies look like step ladders against the mountains. We see a pack train on a road, winding its way along like a column of ants. Suddenly over the interphone it comes, slowly and deliberately: "Target sighted, keep 'em crossed." The bombardier calls, "Bomb bay doors open." The sight is on PDI, which tells the pilot what the bombardier wants, all the time his trained eye glued to the eyepiece... adjusting... calculating... placing his target in the reticules. Then it is "bombs away" and the doors slowly close again. A sigh of relief comes as the "old man" waggles his wings, implying: "Carry the ball; the job's done." Then we bank in a semi-circle, heading for home after a nerve-wracking raid on the Nip. PUFF OF SMOKE . . . . OBLIVION But wait. Something's gone wrong with one of the other planes. The left wing ship... it's on fire... and smoke pouring out both the engine narcelles and spreading to the leading edges of the wings. Christ, what's happening? "Didn't see any ack-ack, did you, Rhoades?" He's a young Missourian and his voice is thick as he answers in the affirmative. All this time, the ship's pilot, Capt. Weaver, puts the bomber in a deep bank to clear the formationm so's an explosion can't damage the rest of the flight. The last we see of them they're going down... down... down... 'til there's a flash and a big puff of smoke on the city below us. Not a man got out... There's a feeling of emotion that creates lump in your throat and leaves your knees weak... You wonder... There was Kelly's wife and a tiny daughter who'll never know her father... Blades, and the cute girl who was always writing... And Cave. Who's going to get his pet camera?... Lee, a helluva swell officer... Weaver and Lyman, who were going home soon... and Shirley, who did more than his share. On Dec. 7, 1941, the handwriting on the wall was written in blood... the blood of the men at Pearl Harbor, Wake, Guam, the Solomons... and the answer will also be written in blood... their blood. It stretches credulity to the breaking point, but Roundup's informant swears it's the truth, so help him. A G.I. newly arrived in India, desirous of informing his folks of his whereabouts, wrote: "You can reach me at APO (censored), care of Postmaster, New York, N.Y."
His parents wasted no time boarding a New York-bound train to visit their son. One of the postmaster's subordinates broke the bad news . . . gently. CHINA AIR BASE - Back in the good old before the war days, Henry Hemmt, Adolph Polasek and Milton Werner used to meet every night down at the gas station in Hallettsville, Tex. (population 1,500), for a bull session. And then came the war and the old gang was broken up as one after the other of the boys entered the service. And, of course, among them were Henry, Adolph and Milt. As seems to be the traditional Army custom, the three friends were sent to different camps, not to meet again - that is, until last week, when they stumbled across each other by chance here in China. Instead of the gas pump deep in the heart of Texas, one of Al Piro's refueling trucks provided the rendezvous for the reunion of Lt. Werner and Sgts. Hemml and Polasek. All of them from different outfits, they were led to Piro's truck by Lady Luck. Needless to say, they did everything but sing Red River Valley. POOP FROM THE GROUP - We can't match the boys in Assam (Roundup June 10 issue), who had beer, women and promotions all in one day, but we do have a few promotions to report. Congrats are in order for Ed Otis, who now has two rockers under his sergeant's stripes; Bill Sterba, who made staff; Norman Bowsher, Charles Herzberg and George Little, who have three stripes instead of two; and Lewis Van Blarcom, who added one stripe to his lonesome one. Incidentally, after reading the Roundup story about the boys in Assam and their beer bust, a lot of the fellows up here are going to ask to be sent there for a rest cure. They claim they won't mind even if the 10-piece orchestra doesn't show up or if there aren't quite enough girls to go around at the weekly dances. A paving brick painted a brilliant gold is now floating around Capt. Ellsworth's squadron. We haven't been able to discover yet the name of the G.I. to whom it is to be presented. CHOPSTICK TRICKS FOR FAMOUS HOSTESS Madame Sun Yat-sen, widow of the late great founder of the Chinese Republic and sister of Madame Chiang Kai-shek, entertained American soldiers recently in her home with a dinner dance. T/Sgt. 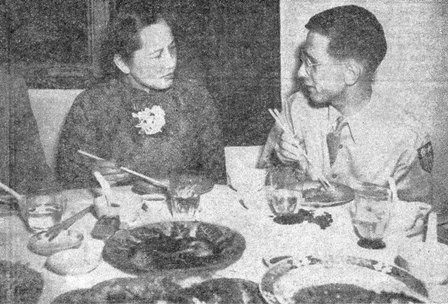 Charles T. Rodbourne eats vigorously (if not too expertly) with his chopsticks, while Madame Sun Yat-sen looks on arrovingly... a a trifle indulgently. ASSAM HOSPITAL UNIT - Last week the G.I.s who fight with hypodermics instead of guns threw a beautiful brawl for the brilliant opening of their new Recreation Room here. The committee in charge, headed by Sgts. Smith Dawless, Ray Schieltz, Don Foss and Tom Grant, by Cpls. Chuck Forbes, Bob Dougherty and Bill Pappas, went into a huddle and emerged with some earth-shaking ideas for decorating the 80-foot basha. A V-shaped Victory Bar, made of fine-grained Indian wood, was adorned with breath-taking, voluptuous Varga girls. 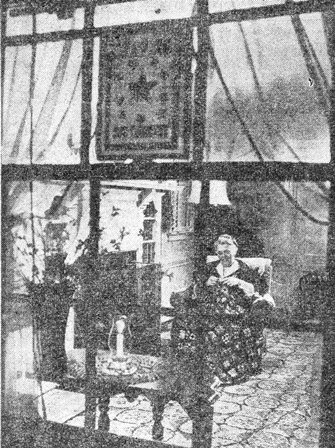 Cobalt blue curtains sported large white suns and stars from the C.B.I. insignia. Behind the bar cavorted a leaping kangeroo nurse with her oiling offspring, an insignia designed especially for the unit by Walt Disney. A handsome striped rug flowed down the center of the room like a king cobra. Potted ferns, purlined from the jungle, filled all empty corners, and long cascades of orchids planted in hanging baskets lent an air of exclusiveness. To guarntee the girls promised to the boys, the committee stuffed blue barracks bags into definiely mammalian shapes, topped them with cardboard heads of ogling blondes and brunettes to grace the Mae Westian charms below. Highlight of the evening: Cpl. Vince Caruso and his moaning, mean, extra-ecstatic Jive Bombers playing the unforgettable rhythyms that have won them fame and a heap of good times all over Assam. Toward midnight, when the smoke was almost as thick as the speech of the Medics, several of the boys spotted visions of loveliness floating in from a side door. They were more beautiful than the orchids, more fragrent than the bowls spilling over with white gardenias. Moreover they could talk, dance, and - in the immitable way of girls all over the world - could persuade one for the moment that he was home in Philly, in Chi., of L.A. But they couldn't be flesh and blood. Not in Assam. The boys blamed it on the punch, and went right on dancing with the visions until they vanished at the stroke of midnight like frightened Cinderellas. CHINA AIR BASE - The boys who started the "Foster Father" program at the war orphans' camp near here have the ball rolling back in the United States. A member of this 14th Air Force medium bombardment squadron (only one of the organizations which has "Foster Fathers" on its roster) recently received a $100 money order for the camp from the president of a Sioux Falls, S.D. bus line; $10 from a public accountant in the same city; and $5 from a G.I. stationed in Florida. Each officer or enlisted man of the 14th U.S. Air Force who desires to adopt a child pays $5.00 per month for the care (which includes housing, feeding, clothing and medical attention) of "his" boy or girl. Those fortunate enough to wrangle transportation to the camp make regular visits in their off-duty hours to visit and romp with the kids. This Good Samaritan policy works two ways, as the "foster fathers" have been entertained by some of the finest people to be found in all of China. CHINA - (UP) - The Japanese have offered a $40,000 reward for the head of Madame Chao Yutang, 68-year-old leader of a Chinese guerrilla band which has killed many thousands of Japanese soldiers. The Chinese national heroine, "Mother Chao," has sworn to battle the invaders until they are driven beyond the Yalu River in the north-eastern provinces, her homeland. She still takes occasional pot-shots at the Japanese, but her main task is directing 30,000 guerrillas in raids on Japanese troop convoys. Madame Chao has fought the Japanese since 1931. When the Japs invaded the north-eastern provinces she smuggled food and weapons to the "Iron and Blood Army." She is now Gen. Chao. Rolled dark and high on the west where the sun had gone. Rolled long and familiar to the north, when the wind was still. In the blue and violet burning dusk of home. Lives and breathes for our love, when its petals are foam. Burns clean as white ash over the Holyoke range. Your step, your voice, the sound of your gun in October. The roads through hemlock, the partridge that thundered and flew. The leaf-mold under your feet, the blue sky over. Pale in your pulse, these are what you are still known by. These are what guards our hearts, and yours together. This is the love the valley keeps, through the winter weather. To whom is said, "Take over, son?" In hopes that he may see a better day? May ride the seat of glory on the left. Checking gas and other sundry things. And wishes he but ranked a higher grade. "You alert the ship tonight, my son." Is told, when asking "How 'bout me?" That "Yours is really not to reason why." HQ, IATF - Inspired by Roundup stories of sling shot victories on other fronts, our two most newsworthy citizens, S/Sgt. Harold Fioravanti and Cpl. Jack Langemak, fashioned themselves death-dealing weapons and set forth on shikar the other day. In short order, a jackal was brought to bay in the vicinity of the cantonement, but the sly creature took refuge in a culvert, and the huntsmen stood baffled. After a short conference, it was resolved to "smoke him out," American style. Soon a goodly fire blazed, clouds of black smoke rolled skywards, and an austere British lieutenant appeared on the scene. He watched the two alternately heap fuel on the fire and then peer intently into the culvert. His curiousity was aroused. "What," questioned he, "have you got in there?" Two smudged faces looked up. "A jackal." Pause. Then, "Are you sure/"
At this point, things were getting pretty stuffy in the culvert, so friend jackal decided for a quick gander outside. Fioravanti twanged his slingshot out arm's length and let fly... bullseye. After that the jackal's health failed rapidly, and our stalwarts presently returned to camp dragging their spoils behind them. After everyone had admired the trophy, the carcass was hung from a tree behind the barracks. In view of the heat of the season, however, the boys were given just three months to remove same to other premises. Receiving congrats last week was M/Sgt. Aubrey C. Stevens, who on June 16 polished off his seventh hitch, 21 years in harness, of which nine were spent in China. An old hand in the East, "Steve," in charge of the substinence department, sets a neat table in the mess. His two sources of pride are the pie turned out by his proteges in the kitchen and his own beautiful head of skin. With him it's a case of premature baldness, however, for Steve has lots of young ideas, the rascal. CHINA SQUADRON CHINA - Officers of an air squadron thisaway dug into their jeans, and it wasn't long before two young steers appeared upon the scene. Suffice it to say, they didn't continue their existence long enough for anyone to call them by their first names. Soon everyone was gathered around the festive board for grilled steaks (heavy on the plural), french fries, some of Lt. "Doc" Livingston's specially supervised hamburgers and gallon upon gallon of tooth-some Irish stew. No one seems to know exactly how it all came about, except Livingston, Sgt. L.O. Taylor and Cpl. Murrah. "Doc" turned out to be a prize chef, as well as one of our top P-40 drivers. - by Lt. VERNON J. HENDERSON. Among 142 awards recently made to 10th Air Force officers and enlisted men were the first Oak Leaf Cluster to D.F.C's for over 300 combat hours; two Soldiers' Medals, first earned in this Theater; and awards for a hazardous flight over Bangkok, Thailand, to six officers, three pilots and three navigators. Soldiers' Medals went to Sgt. Willie H. Bryson, who was injured extinguishing a lighted field range in a kitchen that was filled with vapor and fumes from another stove, although he was knocked down and burned; and Pfc. Frank R. Oropeza, who ran into a fiercely burning plane and rescued the injured pilot. Lts. Robert C. Bailey, Raymond C. Roie, Guy H. Spotts, Ralph M. Olson, James E. Rogers and James E. Traweek guided the only three planes of a flight to reach Bangkok through hazardous weather over the Malayan Peninsula and the Gulf of Siam. Lt. Col. William R. Stark, Capt. J. Royden Stork, Lts. James H. Austin, Leland G. Berlette, Bill E. Carson, John E. Stephens, Warren M. Vandebogart, Charles R. Agree, William G. Clark, Richard R. Clements, John S. Crall, Robert C. Delcamp, William S. Eliel, Henry G. Gores, William B. Goris, Lewis S. Harris, Tom W. Jackson, George H. Kimball, Joe M. Kortman, Lenonard C. Hicks, Irving I. Kuehnast, Hugh P. MacPherson, Willis J. McLaughlin, James R. Myer, Alfonso B. Perez, Lancer W. Robertson, Samuel R. Rogers, Henry C. K. Spotswood, Roy A. Wentz. M/Sgt. Henry J. McElderry, T/Sgts. Charles C. Bowen, William T. Anderson, Frank L. Cunio, Jr., Floyd V. Funderburg, Joe F. Gingrich, Minor F. Green, Leo E. McDaniel, Leonard J. Prough, George C. Ruch, Jack E. Rundell, Louis L. Russell, Thomas E. Shackelford, August Slivensky, Lawrence W. Bowen, Denslow E. Wood. PROUD MOTHER Ten stars proudly grace the service flag of Mrs. Emma Van Coutren of New York City. Six sons are in the Navy, one is in the Army, and three daughters are WACs. Henry W. Ley, Herman Litz, Victor L. Miramontes, George G. Danfield, William E. Heater, Arthur E. Hillyer, William R. Ober, Clarence A. Pawkett, John W. Ring, Elliot J. Ryan, George Scheider, William F. Shelley, William E. Steinkeliner, Henry G. Vanis, Ernest B. Weaver, Jr., Uhel F. Whitsell, Sgt. Lloyd A. Klar, Cpl. Charles W. Moreley. Majs. Joseph S. Pirruccelio, Wesley Werner. Lts. William M. Gilbert, Richard T. Henning, William S. May, Robert J. Shimanek, Ted M. Winzer, Malcolm J. Milligan, Maynard Hatieberg. T/Sgts. John W. Imre, Robert A. Mayotte. S/Sgts. Wesley V. Blackwell, Charles Botuk, Walter M. Migdat. Maj. Joseph S. Pirruccelio, Capt. Robert S. Puckett, Lts. Reino L. Aalto, Allan A. Lathan, Clarence A. Roitsch, Clarence H. Suber, Gordon H. Wilson, Gordon E. Clevland, Joseph C. Crownover, Francis J. Doherty, Charles V. Maloney, Paul J. Paskey, John E. Thornton, Bill Wright, Robert C. Bailey, Ralph M. Olson, James E. Rogers, James E. Traweek, Fred C. Huffman. T/Sgts. Robert E. Borden, Edward J. Chalet, James A. Fisher, Maurice M. Friedman. S/Sgts. Roy W. Billington, Victor H. Elias, Robert L. Fletcher, Andrew J. Gillespie, Frank B. Hobbs, Walter J. Kappel, John M. McNeill, Dwight L. Ralston, Marvin H. Riehl, William C. Roberts, William F. Shelley, Alfred T. Stank, Wayne C. Walker, Joseph A. Cushman. Lts. Raymond C. Roie, Guy H. Spotts. Sgt. Willie E. Bryson, Pfc. Frank R. Cropeza. WEST INDIA BASE HOSPITAL - The usual silence of the Indian night is now being shattered by the soft notes of Trumpet Rhapsody, which Cpl. Fred Poterala and Pvt. Albert Milhem practice religiously in an abandoned barracks far away from the turmoil of the occupied barracks. "True art suffers in silence." Some of the boys - and after all these months, too - found to their discomfort that the Indian sun is not exactly like the one that shines down upon Muskoke, Mich. Returning from a Sunday relaxing period, after being out in the sun all day, the lads resembled one of those newly painted fire trucks you used to run after in your younger days. 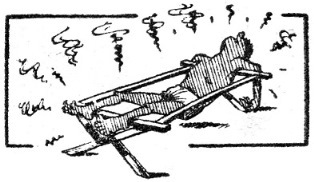 SUN BURN VICTIM T/5th Claude Martin, one of the most painful victims, slept with the canvas out of his bunk, with his head propped on one end and his feet on the other. The rest of his body was free from any rough surfaces. And he still moaned all night like a victim on a rack. Perhaps those movies we see over here tug at the heart strings of the folks back home, but to hard, experienced veterans "over here" they sometimes take a beating. For instance, Me and My Gal, starring Judy Garland, was being aired at the local flickers. The big dramatic scene of the opus unfolded upon the screen. Judy and her dancing partner had just won the booking for which they had been striving all through the picture. Success at last! TRAGEDY STRUCK They talked enthusiastically about the songs they would use for their initial appearance, and all seemed rosy. Then tragedy. Slowly Judy's face turned to the door of her dressing room and her partnet reeled in with a card in his hand and disappointment etched across his suffering features. Dramatically he announced: "I've been drafted." "O.K., ship him to India." EAST INDIA AIR BASE - Henry McLemore, well-known columnist, hit the nail on the bean when he observed in a recent humor-piece published in Roundup that the average Yank soldier, from the amount of bragging he devotes to his home town (whether Bigtown or Jerkville) is utterly convinced there is no other spot comparable on God's green earth. And this squadron's got 'em from everywhere, all 48 states and a weird assortment of towns being represented. Take, for instance, Lt. Emmett C. Hannes -he's from Dime Box, Tex., a sleepy little hamlet that gives census takers only a few minutes work every 10 years. Then there's lanky Pfc. Robert Kraak, who hails from Mazomanie, Wis., and Cpl. Paul Hunsberger, who proclaims to the skies that he's from Wakarusa, Ind. Going on, we come to Yazoo City, Miss., the "old home town" of S/Sgt. 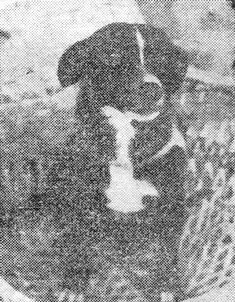 Frank Oakes, and Floydada, Tex., which claims Pfc. James C. Williams as one of her native sons. Not to be overlooked are Maquoketa, La., made famous by Glen (Winston) Henton of horseshoe, billiards, music and "double-talk" fame (not to mention angles for getting in to early chow), and Blowing Rock, N.C., the pre-Army stamping ground for truculent Cpl. Preston Alexander. And then, of course, if you hadn't previously heard of Catawissa, Pa., you soon knew all there was to know about this bustling little community from Sgt. Leroy A. Blass; the same is true of Hadlyme, Conn., on the map only because of Sgt. Walter (Ouch, my head) Block. Necedah, Wis., a charming wide spot in the road, has as its chief claim to fame the nimble-witted and profound conversationalist, Pvt. Anton Novotney, while Pfc. Glen Abrahamson has pronounced far and wide (even in his more sober moments) that he's from Decorah, Ia. Looking again, there's Metuchen, N.J., a name on everyone's lips since Lt. Raymond Farrington joined the outfit; Eudora, Ark., of which volumes has been uttered by T/Sgt. Clarence Connerly; Giatto, W. Va., the garden spot unexcelled in the opinion of Pfc. Cloid Burnette, and the Rifle, Colo., of S/Sgt. David George and the Quanah, Tex., of Pfc. Jack Kerley. This could go on and on but it should give you a fair idea that every mother's son here is a one-man Chamber of Commerce for the little burg back home. God help me if all those mentioned come around after this appears and beligerently demand to know about a Ludington, Mich. All in fun, fellows! CHUNGKING - Aerial activity by the 14th Air Force in China has not been reported for over a week. The last communique told of B-25's, with P-40 escorts, bombing enemy warehouses at Hwajung; B-25's and fighters bombing and strafing enemy troop concentrations and supply depots at Shihshow; and a gun boat and enemy river tug being strafed near Takingyi. All planes returned safely. Meanwhile, the Chinese are preparing for a Japanese counter-attack up the Yangtse, following the Nips' recent setbacks in their drive toward Chungking. Chinese troops during recent weeks have been closing in on Ichang on a wide semi-circular front from the south of the Yangtse and have cut the main road from Ichang to Hankow. It is doubtful, reported a Reuter's correspondent, quoting Gen. Cheng, that the Chinese will be strong enough to take Ichang. The hiring of a local conveyance in either China or India invariably proves that "hope springs eternal" in the thorax of an American. Coming from a land where buses, streetcars and taxis prey upon the innocent pedestrian and where you can subway from the Bronx to the Battery for a nickel, traveling down-wind behind a horse or a Chinese ricksha coolie takes us almost back to the days when Jonah set up light housekeeping in the small intestine of a whale. The great majority of troops get about in tongas or gharris. 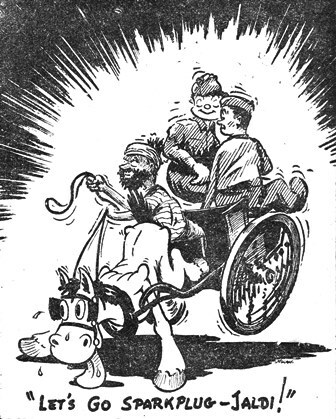 The tonga, as everybody knows, is a two-wheeled, one-horse-power conveyance piloted by a tonga walla. The gharri is the same with four wheels, which means that there is twice the percentage of a wheel coming off in flight. Floating power and individual wheel suspension have come neither to the tonga nor the gharri. Up in China, It is fashionable to get about by sedan chair or in a cart pulled by the inevitable Szechuen pony. There are some in both China and India who just walk for the sheer Hell of the thing. In most Indian towns, there are established tonga and gharri rates established by administrative fiat. Appanrently the walla has never heard of these and demonstrates a surprising lack of knowledge of the English language when reference is made to these rates while trying to pay a lawful fee. The walla, you will learn, is inevtibly a "poor man" while you, in his opinion, are a rajah, if not a Maharajah. The fact that you refuse to pay four times the established rate for developing a floating kidney in his hack is an insidious plot to lower the standard of living of the entire Indian body public. The Indian taxi is another strange contrivance. It is strange in that it usually has a motor that never works. If you think you are smart you check the speedometer before starting on a junket and then start to pay the established rate at your destination. This you will find to be a snare and a delusion because the driver will inform you with an air of judicial calm that his speedometer doesn't work and you have actually traveled twice as far. Then there is the high price of petrol and the astronomical cost of repairs. You have probably been riding in a Chrysler Imperial that hasn't seen the inside of a garage in 15 years. Up in Chungking, the "European" climbs that city's multiplicity of steps in a sedan chair. This monstrosity is carried upoon the shoulders of two small, but surprisingly sturdy, coolies and is built to accomodate to rotundum of a debutante rather than that of a desk soldier. If you weigh over 150 pounds the chances of the chair poles breaking and you bouncing happily down a couple of miles of stone stairs are excellent. 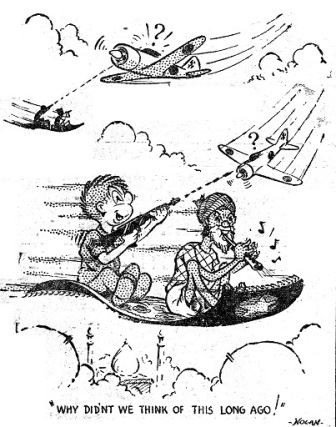 Riding in a ricksha brings the horrible peril of collision with a "honey pot." In case you don't know what a "honey pot" is, write any soldier in China. If you should collide with one, have your .45 handy so you can shoot yourself. At home psychologits have written learned tomes about the increase of insanity caused by the high speed automobile life we all live. Boy, is that for chuckle! The C.B.I. Roundup is a weekly newspaper published by and for the men of the United States Army Forces in China, Burma, and India, from news and pictures supplied by staff members, soldier correspondents, the United Press, and Office of War Information. The Roundup is published Thursday of each week and is printed by The Statesman in New Delhi, India. Editorial matter should be sent directly to Lt. Floyd Walter, Rear Echelon Hq., U.S.A.F., C.B.I., New Delhi, and should arrive not later than Monday in order to make that week's issue. Pictures must arrive by Sunday and must be negatives or enlargements. Stories should contain full name and organization of sender.